Mohammad Abbas has England’s top-order in his sights. 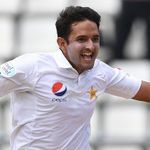 Abbas has taken 23 wickets at 21 apiece in his first five Tests for Pakistan Mohammad Abbas has England’s top-order in his sights. My idea is to experience bowling in such conditions which will be similar to those I will encounter when I play the Tests series for Pakistan against England in the coming weeks. That was a disappointment and a regret that I have carried with me, but I am hopeful that conditions in England will be much better for my style of bowling, and I will be able to perform well to help Pakistan to victory in the upcoming series. Abbas: Whilst each wicket that I take is important in any series, my plan in this series would be to take the wicket of the England captain Joe Root and then follow it up removing other senior players in the batting line-up.